Home Sports IMPRESSIVE!!! 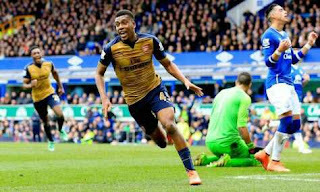 Thierry Henry says Iwobi’s emergence at Arsenal “a source of pride"
IMPRESSIVE!!! Thierry Henry says Iwobi’s emergence at Arsenal “a source of pride"
Arsenal legend, Thierry Henry, has hailed the emergence of Alex Iwobi, after an eventful week for the youngster. The 19-year-old made his first Champions League start against Barcelona and his first Premier League start against Everton, where he scored the Gunners’ second goal. Henry was full of praise for Iwobi’s performance and talked up his abilities and attitude. “Watching Iwobi against Barcelona on Wednesday will have been a source of immense pride and joy for academy head Andries Jonkers and all the coaching staff who have worked with him over the years,” Henry wrote in his weekly column for The Sun. “Alex wasn’t scared against the best team in the world in the Nou Camp. He was brave on the ball, calm in and around the penalty area and justified all the work invested in him by the academy. “He is the perfect example of how a kid has to behave to make it to the top. He works hard, he listens and he is always on time.